(CNN) -- Do you have questions about dangers in the environment? In the air? In the water? In your home? Click here to ask Dr. Sanjay Gupta. Then watch him live Tuesday, June 1, at 3 p.m. ET on CNNHealth.com. Your question may be answered. And tune in Tuesday-Wednesday, June 2-3, 8 p.m. 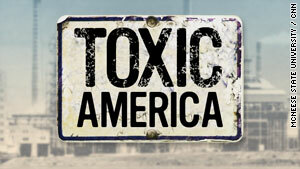 ET, to watch his two-part investigation, "Toxic America."